Marriages of convenience are so… inconvenient. I made a rookie mistake when I began reading Roomies. I decided I’d read a few chapters before bed and then spend the next day finishing it. Nope. That’s not what happened. I got sucked into the story and was up until 4 am, unable to put the book down because I had to know how Holland and Calvin got to their happily ever after. I had to know whether or not Holland found her muse. I had to know if Calvin was as good of a guy as he seemed to be. I had to know how their story played out. See. Rookie Mistake. But it was sooooo worth it. You know how a good romcom will have you laughing out loud repeatedly? While Roomies certainly had its fair share of laugh out loud moments, there were actually a couple of scenes that had me cackling. Not a giggle, not a guffaw, but a full-fledged cackle. Yep, that’s how much I enjoyed Holland and Calvin’s antics. Not surprisingly, their journey wasn’t smooth sailing. Then again, when you get married in an effort to defraud the U.S. government so that an illegal immigrant can remain in the country so that he can play guitar in your uncle’s Broadway show, there’s absolutely no way that’s going to go well. Fortunately for the reader, Christina Lauren took full advantage of the tangled web Holland and Calvin attempted to weave to put the couple through the ringer in order to earn their happy ending. Some of the obstacles were expected – we are talking about a green card marriage here – and some were not, but all were fun to watch play out… except when my heart was breaking for the couple because Holland was full of so much self-doubt that she couldn't trust in herself or Calvin. In fact, I found myself getting annoyed by Holland’s questioning of Calvin’s motives several times. It was as if she forgot that she was the one who proposed the arrangement to him. I had to keep reminding myself that her logic flew right out the window the more she fell for him. And boy, did she fall hard. Thankfully, she finally realized that the fall was mutual, and I was able to put my box of tissues away – yes, this romcom caused me to shed a few tears, but the really good ones usually do. While I adored Holland’s family, especially her uncles, I detested her best friend. Lulu is the reason the phrase “With friends like that, who needs enemies.” exists. I was so glad that Calvin was able to chip away at that particular pair of rose-colored glasses Holland was wearing so that she could see Lulu for who she really was. I will warn readers that, for me, the ending felt abrupt. Once I stepped back for a few minutes, I realized that it wasn’t a case of the story being cut short or rushing to the ending, but rather that I wasn’t ready to part from Holland and Calvin’s company. I wanted to read about the next step in their relationship. And the next. And the next. And the next. I wanted to see if their happy ending was for now or for ever after. Sadly, Roomies is not listed as being the first book in a new series, so I’ll just have to imagine their happily ever after on my own – and I’m perfectly okay with that option. As expected, Roomies was another delightful read from the writing duo of Christina Lauren that left me both entertained and looking forward to their next release. 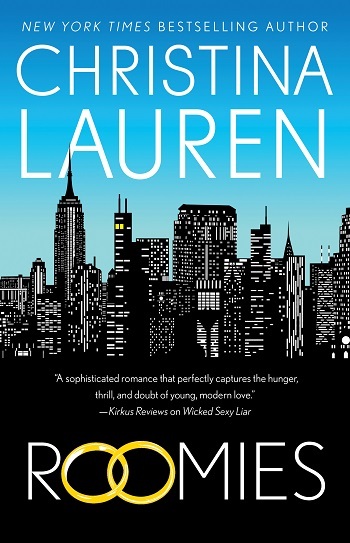 Reviewers on the Wicked Reads Review Team were provided a free copy of Roomies by Christina Lauren to read and review.